Today's lesson plan was to practice short-field approach and landings and soft-field approach and landings. My instructor found a great airport where we could cover all these maneuvers in one location. 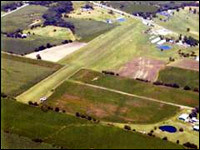 She selected Red Stewart Airport (K401) in Waynesville, Ohio. I was excited about flying there because over 10 years ago, I went ski-diving there with two great friends. That was an amazing experience and it was neat to see this field again from the air. I just needed to remember not to jump this time. I have read that turf runways can be difficult to find from the air. This one was somewhat easy cause it was right off a road next to a golf course and clearly marked on my sectional. We entered the pattern but on the first attempt had to do a go-around as I was too high to make the landing on this short field (2442 ft.). With a short-field landing, especially one that has some obstructions like trees as this airport did, you need to use a steeper than normal approach. That allows the plane to clear the obstacle and still touchdown near the beginning of the runway with room to stop. I had never landed on a soft-field before. It helped me imagine what flying was like for the early aviators who likely knew nothing but this type of runway. Soft-field runways require a slower than normal touchdown. So you use your flaps and pitch to slow the plane down but just before you touch down you add a little power to let the rear wheels settle nicely while you hang the nose wheel off the ground and bring it down gently. You slow the plane down but try not to stop as you could get stuck if the field is damp. The other lesson we learned was soft-field take-offs. In this situation you start your take-off roll with the yoke pulled back causing the nose to pitch up. This prevents undue pressure on the nose wheel and reduces the chance the propeller could strike uneven ground. As the plane starts to lift of the ground you lower the nose slightly to float a few feet off the ground, held aloft by ground effect. As speed increases you can begin your climb. All in all today's, flight was a neat one. Seeing an airport from my past was great but also learning that with a plane and a cleared swatch of grass one can go almost anywhere was also enlightening.